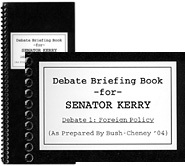 -Prior to the debate the campaign passed out a "Debate Briefing Book for Senator Kerry" This 12-page booklet covered 10 issues (Iraq, Diplomacy, Intelligence, Troop Realignment, Afghanistan, North Korea, Israel, Cuba, The Patriot Act, and Homeland Security). 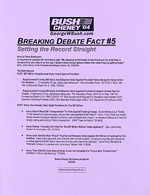 For each issue there were 3 sections "Your Current Position," "Your Record," and "Your Attack." 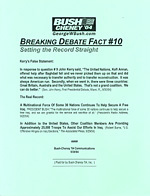 "Your Record" had facts that ran counter to Kerry's current position. 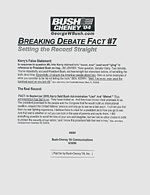 "Your Attack" consisted of a bit of Bush-Cheney devised strategy. 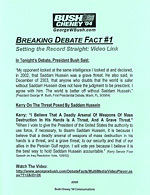 ...Kerry On The Threat Posed By Saddam Hussein Kerry: "I Believe That A Deadly Arsenal Of Weapons Of Mass Destruction In His Hands Is A Threat, And A Grave Threat." SENATOR KERRY: "The president and I have always agreed on that, and from the beginning, I did vote to give the authority because I thought Saddam Hussein was a threat." 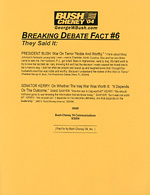 PRESIDENT BUSH: War on Terror "Noble And Worthy." SENATOR KERRY: On Whether The Iraq War Was Worth It: "It Depends On The Outcome." 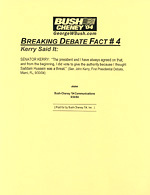 Kerry's False Statement: In response to question #9 John Kerry claimed he's "never, ever" used word "lying" in reference to President Bush on Iraq. 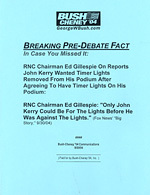 The Real Record: FACT: In September 2003, Kerry Said Bush Administration "Lied" and "Misled." 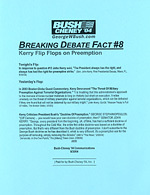 Tonight's Flip: In response to question #13 John Kerry said, "The President always has the right, and always has had the right for preemptive strike." 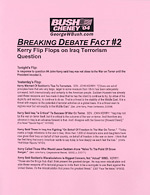 Kerry's False Statement: In response to question # 9 John Kerry said, "The United Nations, Kofi Annan, offered help after Baghdad fell and we never picked them up on that and did what was necessary to tranfer authority and to transfer reconstruction. It was always American run. Secondly, when we went in, there were three countries: Great Britain, Australia and the United States. That's not a grand coalition. We can do better."